Web browsers report redirection loops and redirect chains (pages that are redirected to pages that are also redirected) as errors. Sometimes series of website changes can result in pages being redirected using the HTTP status 301 or 302. This is recommended practice for SEO in order to avoid requests for pages that can't be found. However, what happens when the pages they are redirected to are also redirected? This creates problems with both user experience and search engine indexation crawls. While most browsers will follow approximately 20 redirects before reporting an ERR_TOO_MANY_REDIRECTS error, Google will only follow a chain of 5 redirects before giving up. This is also the case when page A is redirected to page B, which is redirected to page A, creating a infinite loop of redirects. OnCrawl helps you find and fix issues related to redirect loops and redirect chains. Our data also allows you to carry out migrations and modifications without creating new loops or chains, and without producing orphan pages when the final page you direct users to isn't linked to the rest of your site structure. Because redirected pages are identified based on their status code (302 or 301), information on redirected pages can be found in the crawl analysis results, under Indexability > Status codes. This chart lists statistics for your use of redirections. 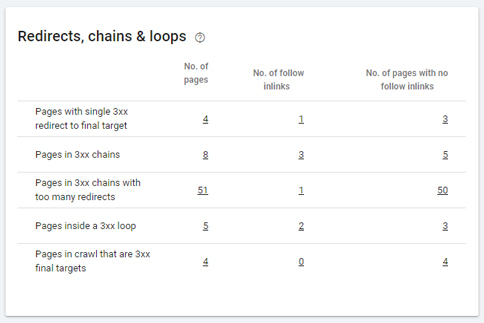 For each of the following cases, OnCrawl will tell you how many pages are involved, how many internal links to those pages we found, and how many of the pages in these redirections are not found in the site structure because no inlinks point to them. These pages that aren’t part of your site structure run the risk of becoming orphan pages if you remove the redirection. Single redirects: page A is directed to page B, and no other redirections occur. This is the expected use of redirections. Chains: page A is redirected to page B, which is redirected to page C... A chain, in this case, is a series of 2 or more redirections. Chains with too many redirects: page A is redirected to page B (1 redirect), which is redirected to page C (2 redirects)… which is redirected to page Q (16 redirects). We alert you that your chain is too long when you reach 16 redirects because it’s around this number of chained redirects that browsers will indicate an error. Loops: page A is redirected to page B, which is redirected to page A… A loop occurs when one of the pages in the chain is directed to another page earlier in the chain. Consequently, there is no final page in the redirection series. Final target of a redirect chain. If you have many pages that all redirect to the same page, this number may be very small, even if you have a lot of redirected pages. If we couldn't reach the final page because it wasn't part of the crawl, it will not be included in this count. This chart presents the status returned for each page that is redirected, once all of the redirects have been resolved. In other words, when a page in 3xx is redirected, this chart tells you what the final status is. 200. The final page is accessible. 3xx. All pages in the redirect series are set to 3xx. In this case, there is no final page because the original 3xx page leads to a redirect loop. 4xx. The final page can’t be found or has been removed. 5xx. The final page returns a server error and cannot be provided. Page not crawled. We did not crawl the final page. 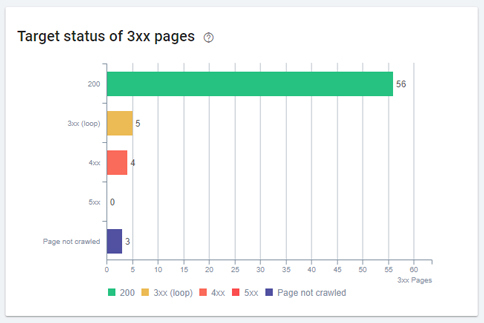 As this chart displays the final status for each redirected page, the total number of pages listed in this chart is the number of pages with a 3xx status. The status of a single target page may be represented multiple times in this chart if it is the final target of multiple pages in 3xx. These charts list all of the pages in 3xx chains or loops, and provide a breakdown by page groups in the selected segmentation, or by page depth. All of this information is available in the Data Explorer. Also visible in the Data Explorer for a page with a 3xx status is the distance from the final page in the redirect chain. This distance is expressed in the number of redirects required to reach the final target page. A chart showing the redirects in the chain that this URL is part of. This URL appears highlighted in blue. The final redirect location for this URL's redirect chain. The distance from this URL to the final target, in number of redirects. The number of pages redirected to this URL. Check for redirect chains and loops when you're looking for leaks in your crawl budget in order to optimize SERP rankings or decrease the time it takes to rank a page.